Floyd "Money" Mayweather Jr. was awarded the WBO welterweight title when he defeated Manny "Pac-Man" Pacquiao on May 2, but it was announced Friday that the 38-year-old megastar will be stripped of the championship due to a lack of compliance. ESPN.com's Dan Rafael was the first to report that the World Boxing Organization officially decided to take back its 147-pound belt from the undefeated Mayweather. According to reports, Mayweather declined to pay the $200,000 sanctioning fee for the title by the deadline. Also, he decided against vacating the WBA and WBC junior middleweight titles, which was necessary since boxers are not permitted to hold world championships in multiple weight classes. "I don't know if it will be Monday or maybe a couple weeks. I'll talk to my team and see what we need to do. Other fighters need a chance. Give other fighters a chance. I'm not greedy. I'm a world champion in two different weight classes. It's time to let other fighters fight for the belt". Mayweather ultimately had a change of heart, which led to last week's bout between Timothy Bradley and Jessie Vargas being fought with the interim WBO welterweight title on the line. For Mr. Mayweather to pick up the paper and read that another promotional company has announced that it is staging a bout for the same WBO title that Mr. Mayweather won in the ring, currently holds and has not relinquished, was extremely disappointing for him and his team. Despite Mayweather's hard feelings, it looks as though he will have no choice other than to relinquish the belt since he has not followed the WBO's regulations. 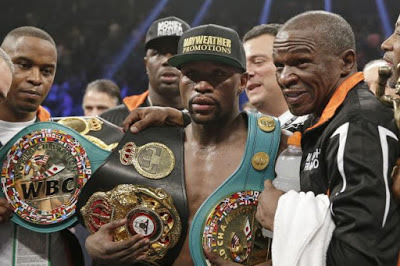 Championships don't mean much at this point in Mayweather's career since he has seen and done it all, so allowing Bradley to hold the title and others to vie for it is likely the best possible move for the WBO in terms of increasing the level of competition in the welterweight division.